We had an extra day in Bangkok and we decided to check out more of the city. What we should have done was just leave a day earlier for Cambodia. As it turned out, the rest of our time in Bangkok ended up being mostly a series of calamities. Right from the start we should have known what kind of day it was going to be when we had to wait forever at Starbucks. After that we walked to Limphini Park where we discovered it was being completely washed down and the lawns were being watered (making it virtually unusable). Hardly any one was there (which was actually really nice), but all the park benches were wet. It’s a very nice park with some great views of city, but we couldn’t sit down and enjoy it. 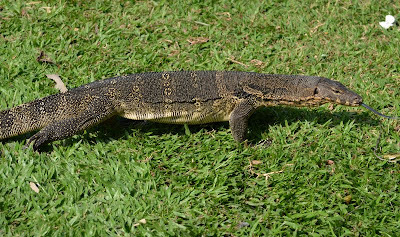 The highlight was when a 4 foot long lizard came out of the pond and stood just a couple feet from Robert. Robert had no idea it was there since he was totally focused on taking photos. When he finally did notice the lizard, he jumped 3 feet high and probably almost had a heart attack. I got a good laugh and he managed to get some good pictures of him. In the park we were also warned by an off duty officer that we should be careful walking around the city since they had recently released a lot of prisoners (due to the recent flooding). He mentioned that they were targeting tourists. That was a comforting thought so off we went to the Siam Shopping District. This area was as modern and cosmopolitan as it gets. It ranks right up there with Hong Kong and Singapore in terms of the number of “name dropping” stores. There were xray machines and security guards at every entrance and exit. The Christmas decorations outside and inside were very typical of western commercialism (and only briefly interesting to look at). 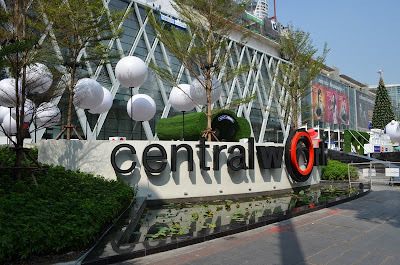 We tried to “shop” at Central World and the MKB (where they charged us to use the restroom), but we couldn’t think of anything we wanted or needed. I did walk away with a chocolate croissant that was pretty darn good though. 🙂 Overall, I guess we were lucky we didn’t get thrown in jail that day. Fortunately we spotted the “no photographs” sign before a police officer spotted us taking indoor photos. The next day in Bangkok wasn’t much better. We checked out at 10am and took a taxi back to the airport. The traffic getting to the airport was horrendous and we had to wait in notoriously long lines at check-in, immigration, and security. Our flight then ended up being delayed several hours ruining our afternoon plans in Siem Reap. At least we did eventually take off. We were thankful to finally be out of Bangkok. Bangkok was better than we anticipated but not somewhere we’d likely return to. 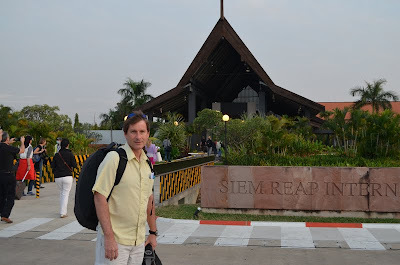 The flight was very short and our approach into Siem Reap was very interesting. The last 15 out of 20 minutes, all we could see below us was water everywhere – including under all the trees. I started wondering if there was flooding here or if this place was like a swamp. It turns out, we were flying over Tonle Sap lake (which is huge this time of year). We landed right before sunset – which was beautiful. I didn’t know this, but Cambodia is incredibly flat – as far as you can see, a hill there is very rare. And whereas sunsets are beautiful lots of places, I noticed right away there is something mysterious about this place that makes them magical here. After deplaning, it took us awhile to get through immigration (even with an e-visa), but it ended up being perfect timing since we had to wait for luggage anyway. A driver from our hotel was there to pick us up and in 15 minutes we were at our hotel. I’m not exactly sure what they gave us as our welcome snack and drink…there was a green jello/gummy bear thing and a green drink. Both were very unique tasting (actually indescribable). Let’s just say they are not destined to be on a top 10 list anytime soon. When we checked-in they also set up a guide and driver for us for the next day. Our hotel had a distinct Cambodian style – lots of wood paneling and statues resembling pieces from Angkor Wat. After a few drinks in the bar and a wonderful buffet dinner we went up to our room to get some much needed rest anticipating the full day ahead of us. We both love food and we both love to cook but neither of us had ever been to a cooking class, so we decided to try one. 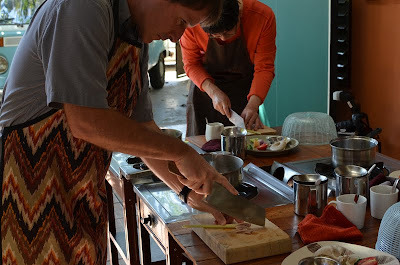 Chiang Mai must have 50+ cooking schools and it was a great way to spend the day (especially if you like Thai food). All of the schools were rated highly on Tripadvisor, so it probably didn’t matter which one we actually chose. In the end, it ended up being a fun and very economical way to spend the day since it went from 8am – 6pm and pretty much included breakfast, lunch and dinner. 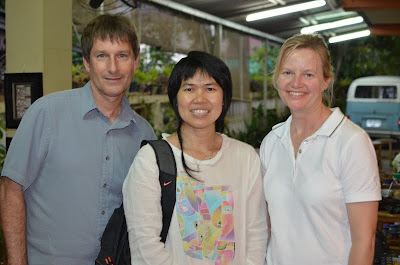 We meet some interesting people and we also ate some of the best food we had in Thailand. Hopefully, our newly acquired knowledge (and the included cookbook) will help us re-create these dishes when we get the urge to eat Thai food again. The hardest part of making Thai food at home is actually locating all the ingredients that give it that uniquely Thai flavor. We booked our class with A Lot of Thai. Yui has been teaching these classes for 10 years, and she only teaches 8 people at a time. We registered for the “Popular” dishes course (which, not surprisingly, included most of our favorites). We were told not to have breakfast, but we did anyway (there was no way we were passing up that). Our pick-up was suppose to be at 8:30, but they were running late and didn’t get to us until 8:45. 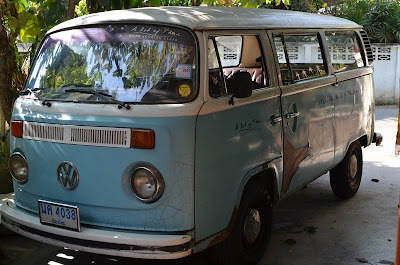 When the van drove up, we chuckled. We could tell right away that this was going to be interesting day. After we picked up one other couple, we arrived at her house by 9am. The class was actually held in her long covered patio area which was bright, tropical and very homey. Everything was already set up for us and we each had our own cooking station. Everyone was introduced and we put our aprons on. Our class consisted of a couple of bee farmers from Canada, a father and daughter from South Korea, and a young couple from London (he was Indian and she was Swedish). The first dish we all made was Chicken Pad Thai. Yui first explained all the ingredients and then she demonstrated how to cook it. We each got to try what she cooked and then off we went to our stations to replicate it. As we cooked she walked around and would repeat steps outloud and correct us if we were doing anything wrong (or adjust or stoves if it was too hot/cold). Our first dish was a success! After we finished cooking, we’d go back to the little picnic area, eat our creations and talk. Having lived in Chiang Mai for so long, she was a wealth of information about the city – especially the good restaurants. The next two dishes we made were Tom Yum Soup and Red/Green Curry. The soup was incredibly tasty in spite of the fact that it only takes about 15 minutes to make. There are lots of ingredients in it, but all we really ate was the shrimp and mushrooms and drank the broth. The rest of the ingredients were mainly for flavor. If I made it this at home, I’d probably strain the big stuff out right before serving it. The curry dish was quite involved and had more ingredients than I thought it would. Robert made the red curry and I made the green curry, this way we could compare. 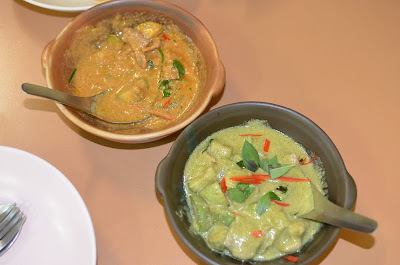 They were both fantastic with the green curry being a bit more spicy than the red. After cooking three of the six dishes, Yui took us to the local market. This was great timing for several reasons. First, it gave us a break from cooking. Cooking is hard work, and at times stressful – especially if you are competing with your spouse. It also gave us time to build our appetites back up. While the serving sizes we made were very reasonable, rice, noodles, and coconut milk are filling, so a chance to walk around felt good. Finally, it also helped us learn and remember what we saw at the market. Since we just used many of the ingredients we could locate a lot of them on our own. The market also gave us an opportunity to purchase hard to find ingredients that we could take home with us. Yui went over a lot more than just what we just did in class. 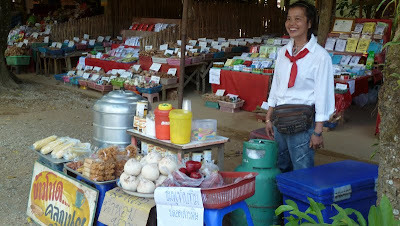 We meet several market vendors, had ice coffee made, watched fresh coconut being ground, and so much more! After about an hour, we headed back to the house to do our next three dishes: Chicken with Cashew nuts (yum!). This one was pretty straight forward with no difficult ingredients, so I’m pretty sure we can do this one again. Our fifth dish was spring rolls (which ended up very crispy – not greasy). We usually don’t make fried food, but this one seemed pretty healthy the way it was done. 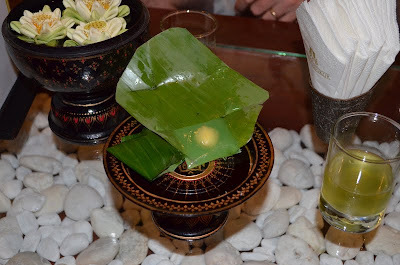 The last dish was my complete and utter favorite – Mango with Sticky Rice. And it was SO incredibly delicious, I thought I had died and gone to heaven. Even without mango this dessert is so good. I know it sounds like it would be easy to make, but I’m not sure I’ll ever be able to make it that good again. The rice she used I’ve only ever seen in Thailand…..but I’m not going to give up, because even so-so versions of this dessert are so worth the effort. It was 6 o’clock by the time we finished and we were all full. No one had made plans for dinner – except us. We had pre-arranged a meeting with friends at 7pm. We did warn them however, that we probably would not be eating, just drinking – and that’s what we did. What a great day! Most people start their vacations by sleeping in…not us. It was Saturday morning, and we were up at 6am. Of course it felt more like 8am given the time difference from Japan, so it really wasn’t a big deal. The sunrise was soooo beautiful, and we had a delicious full buffet breakfast waiting for us. There was more food in that buffet than was humanly possible to consume: a large selection of fresh fruit & juices, pastries, yogurts, muesli, smoked salmon, cheeses, salads, noodles, soups, breads & jams. We could also order anything off the hot menu. We not only tried a bit of everything on the buffet, but we ordered hot meals as well. Heck, why not, we had an active 9 hours ahead of us. 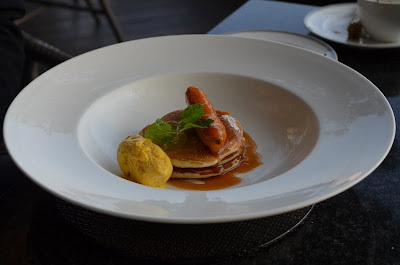 And I’ve got to say….my banana pancakes with mango gelato were particularly scrumptious. As promised, our bike guide and driver picked us up at 8:15am. We found out we were the only ones scheduled for today’s trip – which was an added bonus. We got into the truck and started our 1 1/2 hour drive north. It took a good 45 minutes to get out of the city, but it was worth the wait to see the beautiful countryside. The roads became curvy and less crowded and the mountains and hills became more visible. Eventually we entered a wide river valley and began traveling on small rural roads. I’m pretty sure I couldn’t find this place on my own. The last stretch was on a dirt track (with no signs). We eventually drove thru two large open wooden gates. Within the walled compound was a beautiful little complex. I felt like I was in some scene from Romancing the Stone. There was another group of people (from REI) that had spent several days biking in the area and they were getting ready to leave. After our quick 15 minute rest stop, we were fitted for our mountain bikes and helmets, grabbed some bottled water, and headed on our way up the dirt road. Kiki (our guide) lead the way. She was great. She’d stop along the way and point out the different types of trees, fruits, nuts, rice, coffee, and plants they grew (which is just about anything you can think of). 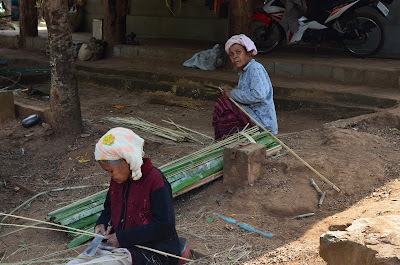 We stopped and watched the locals picking, packaging and hunting. Sometimes we’d stop just to take pictures of the countryside. 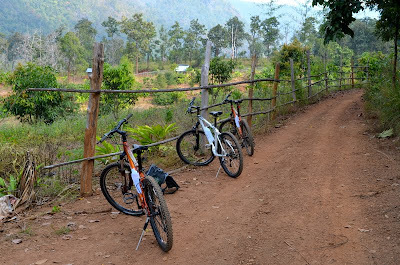 In the course of about 2 hours (and 12 km) we also got to ride through and visit 5 different hill tribe villages (Karen, Akkha, Lahu, Lisu and Palong). These villagers migrated from either Myanmar (Burma), China or Tibet over 100 years ago and each have their own distinct culture and language. The women stayed home and watched the kids, while the men went to work in the fields or to hunt. They shared one vehicle in the village. 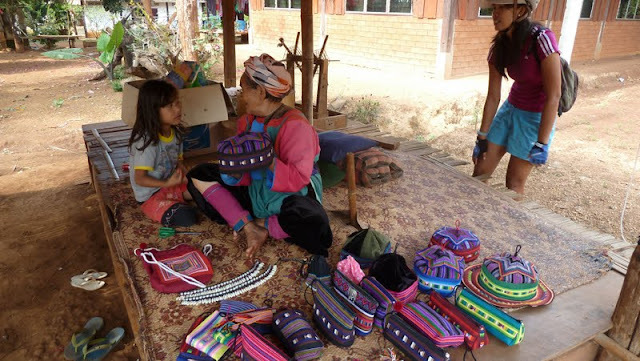 The women worked on crafts made of cotton (hats, coin holders, purses, wall hangings), stones/gems (for jewelry) or bamboo (for baskets). They were always excited to see foreigners and would lay out blankets and display their creations in hopes of making a sale. Chickens, dogs and pigs roamed freely. Their houses and possessions were minimal, yet they all seemed content, and it was very clean. Some of the old women had a very bad habit of chewing on betel nut (a stimulant), and their teeth had become chipped and black. Actually learning about these people while you meet them was very interesting. Before we knew it, we were back at the lodge. It was good timing, because riding on dirt roads without biking shorts and cycling up some good sized hills had started to take it’s toll. The lodge offered us some soft drinks and a huge spread of food. While it was all very good and healthy, we were a little disappointed it wasn’t that spicy. Looking back, however, it was probably not only a good thing, but also intentional – especially since we still had 30 kilometers to go. We rested for 20 minutes and then restocked our water. Off we went, this time down the hills and across the valley. The single dirt track we took was fun. It had a good bit of sand on it (probably from the recent floods), and we would occasionally get stuck. We rode through forest, and then past fields and orchards. Finally we ended up on the rural road from which we could see Doi Chiang Dao mountain in the distance (the third highest mountain in Thailand). The cave at the base of this mountain was our final destination. It was pretty warm that afternoon and the sun was pretty intense. We stopped at a rice “factory” and at a newly planted teak tree plantation for water breaks. The driver followed us in case we needed a break from riding. Fortunately, the closer we got to our mountain, the more shade there was. We made it, but we were both glad to get off the bikes. Walking around felt good. There was a large market here which specialized in natural and herbal medicine. If you had an ailment, they had a fix. I forgot to ask if they had something for my numb bum. We ended up not purchasing anything though, since it probably wouldn’t have gotten through customs in Japan. We walked around the place to stretch our legs, take pictures of all the cool stuff, and cool off before we went inside the cave. 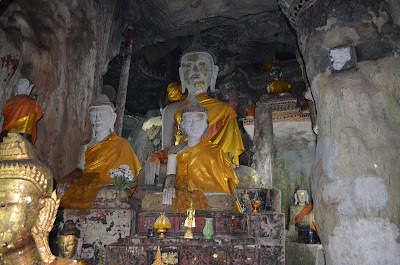 It was similar to other caves – except for the religious statues, articles and decorations scattered throughout. There are supposedly 5 interconnected caves (at various levels) believed to stretch some 12 km under the mountain, but tourists usually only see the first 1km – which, quite frankly, is enough. It’s humid and damp and some areas are pitch black. We went as far as we could without lanterns and a cave guide. At the end of the lighted area, there is an imprint on the wall of the royal emblem – the King and Queen paid a visit here in the ’60’s and someone left their mark.